Darren Wilson not indicted: Grand jury decision announced. Ferguson police after the grand jury announcement. Ferguson police officer Darren Wilson will not be indicted for the fatal shooting of unarmed teenager Michael Brown, St. Louis County prosecutor Bob McCulloch said in a statement on Monday night. 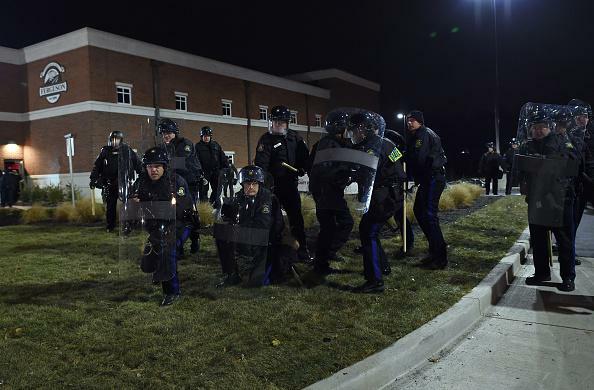 After months of deliberation, on Monday a grand jury returned its decision that Wilson will not face charges, as the St. Louis suburb braced for potential unrest as a result of the decision. At 12:01 p.m., Officer Wilson appeared on the scene, driving alone in his police vehicle. Through the driver’s side window of his Chevrolet Tahoe, he issued an order: Leave the street and walk on the sidewalk. At this point, accounts differ widely. Mr. Johnson has said that Officer Wilson reached through the open window and grabbed Mr. Brown by the neck, choking and pulling him. According to an account that Officer Wilson gave to various authorities, Mr. Brown was the aggressor, punching him in the face and scratching him on the neck. Pinned in his vehicle, Officer Wilson, according to his statements to the authorities, feared for his life and, with his right hand, drew his gun from the holster. As the two continued to struggle, Officer Wilson fired the gun twice, forensic evidence revealed. One shot hit Mr. Brown in the hand, a county autopsy found… Officer Wilson left the car, pursued Mr. Brown on foot and continued to fire. Two construction workers who were on Canfield Drive at the time said in interviews with the news media that they had seen Mr. Brown with his hands up when he was shot. One of the workers said “the officer was chasing him.” Other witnesses said Mr. Brown had turned around and was moving toward Officer Wilson.